Spanish gold coins pieces present some of the most fascinating examples of coin minting industry of the Old World that had existed centuries before the US started minting its coins. Spanish gold coins were often depicted in multiple movies and novels in association with pirates, lost treasure and sunken ships. The Spanish gold coins fascination continues up to this day not only due to their pure gold content, mintage and amazing history behind. Initially, Spanish gold coins named Doubloons were made by hand using primitive methods and manually sized to a specific weight by actually cutting pieces off already made coins. This method gives them characteristic odd rough shape that is especially prized among old gold coins collectors. 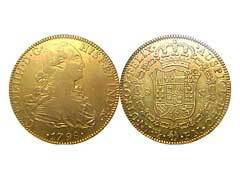 The smallest fraction of Spanish gold doubloon is one Spanish escudo, the escudo denomination doubles creating two, four and eight escudo coins respectively. Doubloons Spanish gold coins were mostly in possession by Spanish noblemen and otherwise richer layers of population and are not as heavily worn in comparison to Escudos. Therefore, the actual Doubloons value by far exceeds the value of Escudos. In the modern world of coin trading, the terms escudos and doubloons are sometimes used as synonyms to describe any Spanish old gold coins. The average price for the oldest Doubloons eBay gold coins can very often be in the thousands of dollars depending on their grade and year of mintage. If you decided to add Spanish old gold coins to your numismatic collection, take care to only purchase coins from respectable and well-recognized coin dealers that can provide certified old gold coins or shipwreck salvaged coins with proper documentation. Increased popularity of old Spanish and French gold coins along with any other historical rare coins attracts a lot of dishonest coin dealers who mislead coin collectors into buying coins for more than they are actually worth. If you are not a numismatic expert, the general rule is to stay away from historical gold coins and choose certified gold bullion coins to ensure their authenticity and decrease investment risk.